The Nice Guys is a great throwback not just to Shane Black’s buddy action-comedy films but also to the shining disco lights of late-’70s-era Los Angeles. 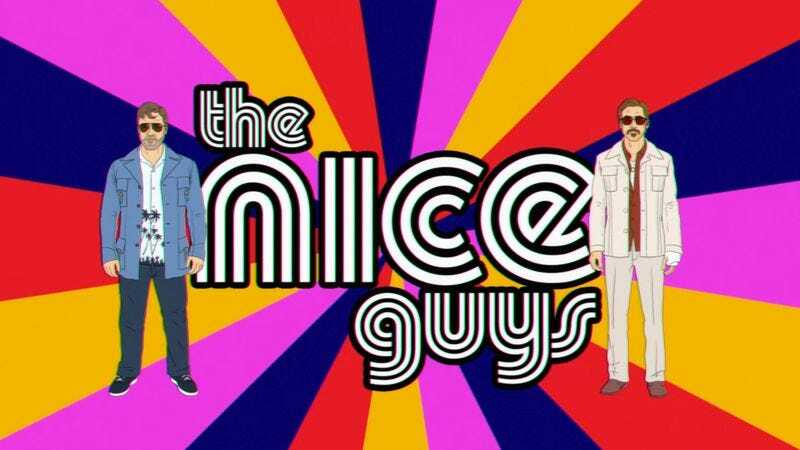 As part of the marketing push for the film, opening in the U.S. this weekend, Warner Bros. Pictures imagined The Nice Guys as a ’70s cartoon as well. The result is an excellent pastiche of the cartoons of that era (like the Mister T cartoon or Superfriends). The animators do a great job of making it look of the time, all of the little details adding up to dead-on impersonation, from the narrator’s voice and various sound effects to shot transitions. It would be nice to live in a world with animated “drunken, sunken” Ryan Gosling and “newly quit boozing” Russell Crowe doling out justice (or avoiding skirmishes altogether) in weekly adventures. Until a more perfect reality arrives, people will simply have to accept this glimpse at what could have been.